[T]he scene is in darkness. The figure might be asleep, or might be prostrate with grief. Suddenly an incandescent light shines, illuminating the central figure and emphasizing the darkness all around. Behind the figure, the light gathers, brighter and brighter, forming into a clear, majestic shape, made of brilliance. Gradually other shapes come on to the stage, drawn by the light, shuffling out of the darkness. The whole stage erupts into a party, as the light spreads further and further. The one who was alone and in darkness is now surrounded by light and laughter. Bit by bit, through the happy sounds, the central character’s voice is heard, singing a hymn. Gradually other voices pick it up, until the whole stage coalesces into one song, a song of praise to the Light. The stage, the world, the cosmos is coming into view through this brilliant light. Epiphany literally means “shining through.” As we remember the story of the Wise Men following the star to Bethlehem, we behold with them, the glory of God shining through the baby Jesus. Advent was a season of waiting in the dark for the coming of God, the light of the world. The Christmas feast is like the first gleam of dawn, bringing promise of a new day. Epiphany is like the rising of sun as the light shines out, giving color, shape, warmth, and life to the world. As we behold the light of God shining out in our Savior Jesus Christ, we begin to see the light of His glory shining out in all the world. Today I want to praise briefly and reflect upon the three kings we meet today’s Gospel reading. In six verses, Matthew references this newborn Jesus as king three separate times. If there is any question about who is the central king in this passage, Matthew makes it clear that this newborn baby Jesus is the King, that is the Messiah or the Christ. Matthew talks about Jesus as the Christ seventeen times and these are grouped around three primary events: his birth, his transfiguration, and his crucifixion. In Jesus, we behold the long-awaited king of Israel, Psalm 72’s Prince of Peace, finally realized in Jesus the Christ. At the end of Matthew’s Gospel, this King of the Jews will commission his disciples to make other disciples in all the nations. In other words, the disciples are sent out with the commission of revealing the King and his kingdom in all the world. As we celebrate the coming of the Son of God into the world. we celebrate Jesus the supreme king, Lord, and Sovereign over all. When rulers encounter Jesus, they are either threatened and resist him or they recognize his authority and submit. This is any kind of ruler: the Pharisees who rule as teachers of the law, the High Priest and Temple rulers, the ruling King in Jerusalem, and the Caesar. Paul makes the bold claim in Philippians “that at the name of Jesus every knee should bow, in heaven and on earth and under the earth, 11 and every tongue confess that Jesus Christ is Lord, to the glory of God the Father.” (Php 2:10–11). When all is said and done, every human must acknowledge only one Sovereign, one King and Ruler of All, Jesus the Christ. Between now and that point of final claim upon the hearts of humanity, we will respond like one of our other kings in today’s reading: either like Herod or like the Magi. The second king we meet is Herod. The Wise Men address Herod the King in verse one. Verse three tells us that Herod the king is troubled by the news of the newborn king. Then he hatches a plot to try and find this threat to his rule. In the following passage, we learn that Herod’s plot involves killing innocent children in search of the baby Jesus. Now before we condemn Herod and move on, we should pause before the successes of Herod. The wealthy people in Jerusalem loved Herod because he was effective at helping maintain their wealth and improve the overall infrastructure of the city. He was actually quite brilliant when it comes to “getting things done.” He knew how to manipulate the powers around him in Rome and Greece for his benefit and he knew how to make things happen. He even built a mountain resort. And by that I mean he built a mountain and then turned it into a resort with swimming pools and all sorts of luxuries. Known at Herodium, this man-made mountain, sat 400 ft above sea level. It housed private apartments. The floors were covered in tiles, mosaics, and wall paintings that recreate outdoor scenes. There was an Amphitheater with an Orchestra Pit, a Palace Garden, a Bathhouse with advanced heating, and of course a swimming pool in the middle of the desert. If Herod were a businessman today, you might say that he slaughtered the competition. Literally. Anyone that threatened his rule was in danger. The innocent children were killed as he sought to kill the Christ. He had his brother-in-law drowned. He strangled his wife. He killed her parents. He even killed his own sons. When he approached death, Herod feared that the people wouldn’t mourn his death, so he gave an order for a group of distinguished Jewish leaders to be killed, causing all the people to mourn. By God’s grace, that order was not carried out. Before we stand in condemnation of Herod, we must face that fact that we carry that potential of brutality against those who would threaten us. Again and again, Scripture reveals that humans are capable of all sorts of horrors. Isaiah suggests that the people of God could be oppressing others even while they assumed they were faithful in their commitments to the law. When I find myself standing up all self-righteously and look down on those in the culture or the church with whom I disagree, I need pause…and come to terms with the mote in my own eye. This doesn’t mean that I cannot condemn wrong behavior in the world, but it does mean that I must be ever vigilant with my own soul. For it is easy to pattern my Christian life after the success plan of Herod instead of the hidden kingdom of righteousness, peace, and joy in Holy Spirit. Finally we come to the third king, the kneeling king. In the story of the Magi, we behold the end of wisdom, worshipping the Jesus the Christ, King of the Jews and Lord of all creation. We are told wise men from East come to Jerusalem in search of the King of the Jews. The actual word for wise men is “magus” or magicians. Magoi refers to magicians who appear to play several roles in culture: priestly role (speaking sacred words at sacrifices); philosophers (seekers of truth); teachers; astrologers; wise counselors. They bring together religious and philosophic disciplines. We do not know exactly what pattern these magi fit, but they may be closer to our image of the Druids or Shaman. They are invested by the tribe with the call to seek out the deeper truths: both spiritual and natural. They are spiritual scientists who study the natural world while also seeking to know the deeper spiritual truths the might be of service to their people. The Druids actually played a formal role in the Celtic tribe as counselors to the king. They preserved the memory of the tribe. It appears that sometimes the bard and druid may have overlapped. So they might sing the story of the people, while also seeking to collect any knowledge both physical and spiritual that might be of service to their people. What’s fascinating about today’s story is that the light of God breaks into the alien world of a pagan philosophical and religious system. God’s light breaks in and leads them to the truth. 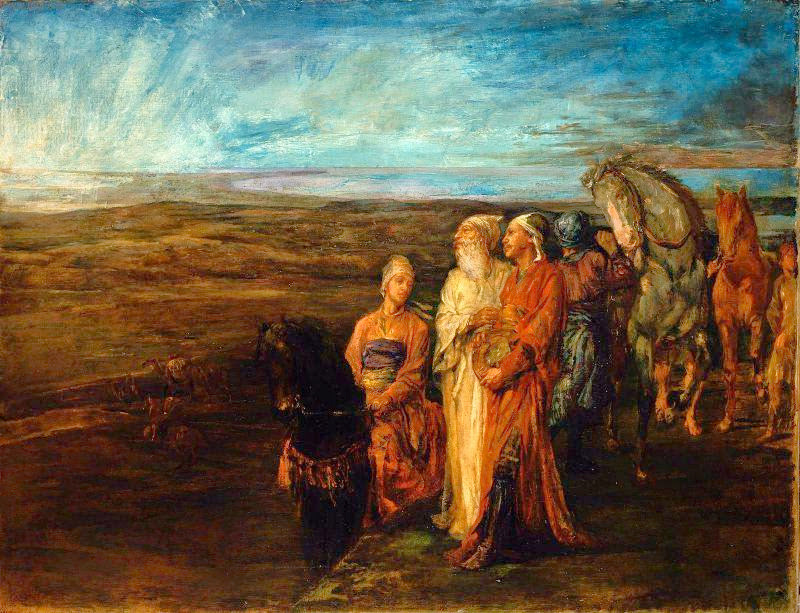 In some ways, we all might be likened to the magi. We have faith because the light of Christ has opened our eyes to behold the truth of God in Christ. Faith is a gift of God in Christ. This month’s issue of Christianity Today includes a wonderful story about a radical feminist professor Mary Poplin, was both a scholar and a seeker of alternate spiritual experiences via hypnosis, meditation, drugs, and all sorts of New Age spiritualities. In November of 1992, Jesus entered her dreams and woke her up. In beholding him, she came face to face with her own brokenness and eventually followed him into a small Methodist church, obeying His call to follow. King Jesus laid claim upon her soul, and she followed. In our story today, the text emphasizes beholding or looking, seeing or knowing. Their eyes opening to light shining through. First and foremost, the star reminds us of how the Spirit of God can work through the heavens, through creation, through dreams, through story, through other people to open blind eyes and reveal His glory, leading people to him. The promise of God breaks into the worldview of a people with a completely different perception of the cosmos. They look, they see, they know as the Spirit leads them both physically and spiritually beyond the culture of the east to behold the King of the Jews. They have come to worship this newborn king. This word worship is proskynesis, to bow down and kiss the earth. They have come to bow down before this king and adore him. In these magi from the East, we see the movement of all creation. The stars above and the sea below, the heavens and earth, all creation is moving toward proskynesis, bowing before this king. And I might consider how might my life take the shape of the journey of the Magi. Our own journey of faith and even our own gathering together involves hearing, seeing, touching, tasting, eating: all five senses are being attuned to His glory. In so doing, we are coming to bow, to adore Him who is worthy of all glory. Kenny has been praying for revival in our lives and our community and our nation. I think we might be compelled to join Him in praying for the revealing, the unveiling of the Son of God in our hearts and in the hearts of the people we work with, and in our families, and in our world. We also have hope that His Spirit is drawing people like the Magi, like Mary Poplin to himself. During this season of Epiphany, let us cry out for Him to come and reveal Himself among us and through us to the world around us.